After Googling 'guitar stand Reverb', one of the first results was a super helpful article on Reverb titled, 'The 6 Best Guitar Stands for Every Budget'. It listed all with all of the comparative specs I needed right on the page (saved me from having to look at each stand's page). Knowing my budget was small, I selected the On-Stage XCG4 Classic Guitar Stand. The price was right, the design was simple, and reviews were good. There's only one I caught that could be improved - when I curiously tried a similar search for 'guitar stand' directly on Reverb, the same article was nowhere to be found. 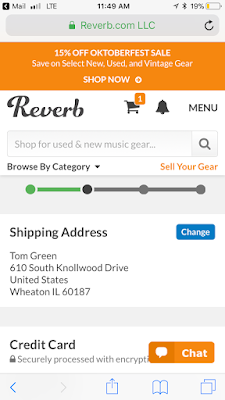 So users relying only on Reverb's search may miss important resources like this unless they do a lot of digging (I ended up finding it but it was difficult). Meanwhile, after adding the stand to my cart, the rest of the process was intuitive. Tap-friendly, bright colored buttons (Add to Cart, Proceed to Checkout) provided effective calls to action. The language used was casual and conversational (How would you like to pay? ), and I was aware of how much work remained in the checkout process by way of a step indicator at the top of the UI.